Malacañang-PSC Kamao’s Visnu Das Javier drives to the basket as Senate Defenders’ Senator Joel Villanueva gives chase in Game 1 of UNTV Cup Finals. 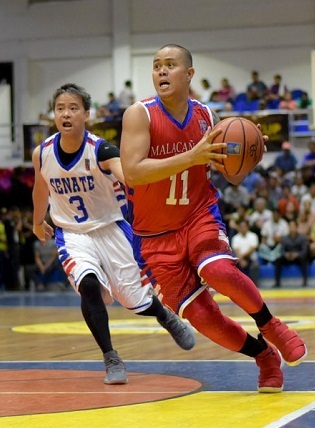 THE Senate Defenders routed the Malacañang-PSC Kamao, 77-62, to move a win shy of capturing the UNTV Cup Season 6 championship on Sunday at the Pasig City Sports Center. Senate’s Jeffry Sanders was hailed as Best Player of the Game with 13 points, 3 rebounds, 3 blocks and a steal. “[Our win] was a collective effort specially on the defensive side. So, credit goes to the players, they played well, and they executed the plan properly,” said Senate coach Mike Fermin. “I have to give it to my teammates, to the entire team, sa coaching staff namin. Lahat nagsasakripisyo, lahat more than willing to walk the extra mile para makuha itong victory na ito,” seconded Sen. Joel Villanueva. Game 2 of the Best-of-3 Finals will be held on Monday at the Smart-Araneta Coliseum. Present on the venue to support the team were the Senate staff, its beneficiaries and Minority Floor leader Senator Franklin Drilon. In the battle for third, the AFP Cavaliers defeated the NHA Builders, 85-84. The Cavaliers got P1,000,000 for their chosen beneficiary, the AFP – Educational Benefit System Office, plus P200,000 for the team. The Builders, on the other hand, will donate its prize of P500,000 to the NHA Provident Fund Association.